Space ninjas have questions too. Warframe is a free to play action game from developer digital extremes. In the game players take control of Tennos, a race of people who specialize in sword and gunplay. You're basically a space ninja and that's OK. Like any free to play game there are premium items to purchase. We break down the co-op aspects of the game along with some of the items you might be spending money on. How many players can play Warframe locally (couch co-op)? How many players can play Warframe via system link or LAN? How many players can play Warframe online? How do you begin a co-op session in Warframe? Can I join a game if the host is further along than me in Warframe? Can players share or trade items in Warframe? Is there a match making system built into Warframe? What are the currencies available in Warframe? Are there any paywalls in the game? Are there clans or persistent groups in Warframe? None. Warframe only supports online co-op. 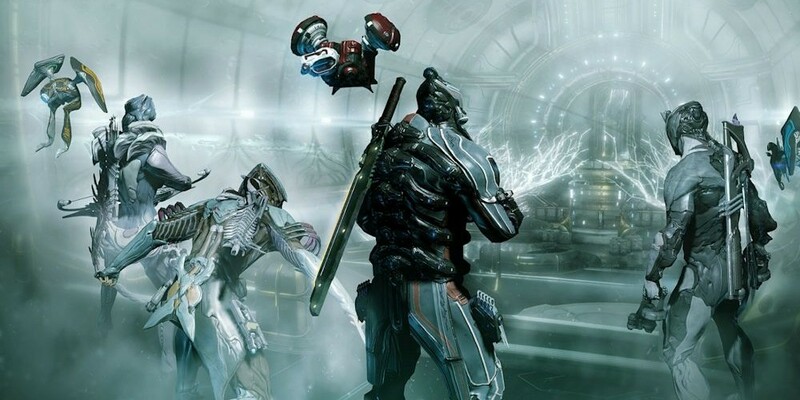 Up to four players can play Warframe in online co-op. The top middle section of the interface allows you to change the matchmaking to Single Player, Private, or Online. If you'd like to play a mission with random folks simply keep it Online and select which mission you'd like to play. If you'd like to play with friends, simply select private, invite your friends from your friends list, and select a mission. Yes, though missions are designed for specific level ranges and can be extremely difficult or easy depending on how far you are outside of that level range. No. Digital Extremes have mentioned in their livestreams/Q&A chats that they’re looking into possibly implementing something down the road. Yes, the game will automatch you with players if you want or you can use the built in chat functions. Platnium is premium currency only available to purchase while Credits are earned through playing missions. Inventory space is only available via platinum currency. Other items are geared towards this currency as well, such as different skins for your warframe, but you can build most things in the game if you find the right resources. It should be noted that creating a new account gives you a small portion of the premium currency too. Yes, you can form a Clan with your buddies and even deck out your own Dojo. Each member of the Clan will need to craft a Clan Key using materials that are fairly easy to acquire in the first few missions.